At the grassy knoll and in the rest of Dealey Plaza they still debate it nearly 54 years later: the assassination of John F. Kennedy—the murder at 12:30 p.m.; a 46-year-old rushed to Parkland Hospital, given last rites and pronounced dead 30 minutes later; ensconced in a bronze coffin by 2:00 p.m. and escorted to Dallas’ Love Field airport; vice-president Lyndon Johnson sworn in as the new president at 2:39 p.m. before Air Force One leaves the tarmac; Jackie Kennedy, the rest of the presidential party and her husband’s body flown back to Washington D.C; the gloomy and dark November evening arrival at Andrew’s Air Force Base. The swiftness and severity of the events on November 22, 1963 would play havoc with anyone’s sensibilities. It is not surprising the tragedy is still scrounged over for historical scraps of meaning more than a half-century later. 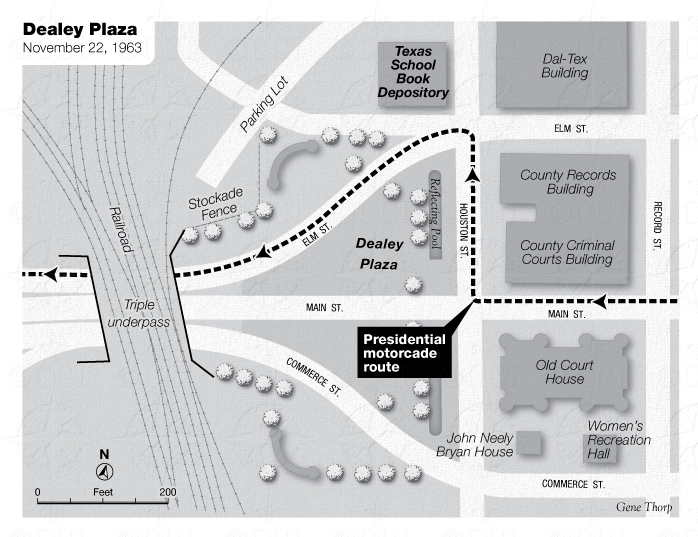 I walked through Dealey Plaza on Sunday for the first time. The JFK assassination conspiracies which once raged in books, magazines and newspaper clippings and which long ago went online still appear at Dallas street-level: A few who appeared to be conspiracy theory regulars set up their card tables and partial umbrellas to shade themselves from the still-hot, mid-day Dallas October sun. They plied their wares: books, DVDs and intense assertions about the “real” multiple assassins of America’s then youngest president. One fellow was perched on the sidewalk that abuts the “grassy knoll”, the green slope that rises north to trees and a parking lot, and angles down again, west, where it abuts a triple underpass, the one where the presidential convoy in 1963 accelerated into, under and away from just seconds after Kennedy was shot. This past Sunday, two other men, just across from the grassy knoll on the other side of Elm Street (the street where Kennedy and Texas governor John Connolly were shot) also appeared to be engaged in a robust exchange of views. More than a half-century distant, the events of that day are apparently, for many, unresolved. JFK conspiracy theories abound. Plenty of people reject what they deride as the “official” narrative, the 1964 Warren Commission and subsequent investigations which found that Lee Harvey Oswald acted alone in planning and carrying out the assassination from the sixth floor of the nearby Texas School Book Depository. I suspect then they are unlikely to be persuaded by additional material on the 1963 assassination of America’s first twentieth century-born and first Catholic president, scheduled to be released Thursday. As the Boston Globe reports, 88 per cent of archived material that relates to November 22, 1963 has already been released in full; another 11 per cent is also in the public domain but with redactions; that leaves just one per cent still off-limits, a fraction which may make little difference to already-unconvinced minds. There are reasons why people believe in conspiracies. For one, small-scale conspiracies do exist, though are unremarkable: You and your friend can “conspire” to defraud a client. Of more consequence, two men can conspire to murder a third. Both are examples of conspiracies, but low-level ones. Also, many countries have intelligence agencies whose raison d’etre is to track, spy on and occasionally take out enemies. But these too are mostly routine and, well, known: Everyone is aware the Mossad, to use the Israeli example, exists and kills Israel’s enemies. We know that the American military uses drones and special forces to kill America’s foes such as Osama bin Laden. But from such routine conspiring some citizens assume wider and deeper conspiracies. Critically and in contrast, those who assert the involvement of multiple high-level agencies of government and the executive branch vis-a-vis Kennedy—a post-assassination cover-up—wrongly flatter themselves. They think they know more about politics and how its internal machinations work in liberal democracies than they actually do. Whether it’s the lead-up to Pearl Harbor in 1941, Dallas in 1963, 9/11 or Obama birth certificates, conspiracy theorists often attribute cardboard-like, two-dimensional motivations to democratically elected politicians, and others in high places. To wit, the conspiracies about the Kennedy killing assume that in a liberal democracy, post-assassination, the late president’s many devoted family, friends and allies or even his political opponents—of which Lyndon Johnson was one while Kennedy was alive—would continually ignore or block the “truth” from getting out there. Conspiracy theorists believe that Americans of significant accomplishment and normally loyal to their own republic above all else, would, in a presidential assassination, direct their own eyes away from some relevant facts immediately after November 1963. In addition they assume that even family such as the president’s own brother, Bobby Kennedy would forever prevent others from also searching for and facing reality. This is not actually how friends, family, loyalists, and even political opponents in the case of presidential murder behave. Rather it’s the reverse, and the reasons for that are legion. Start with the difference between the small and routine conspiracies noted above and what I’d call “grand” conspiracies that allege the involvement of hundreds of people immediately after an event and for decades thereafter. The belief in grand conspiracies is mistaken because theorists equate the holding of power with the ability to control events. But they’re not the same thing. For example, the president of the United States does have immense authority. He can order troops into war (though he is supposed to do so via congressional authorization). That’s power. But it’s not the same as controlling the outcome—winning the war. Or to ponder conspiracy theories that assume a president or other high officials in the American government would plan for or ignore the planned killing of a few thousand fellow Americans—the 9/11 conspiracy nonsense. That assumes Beelzebub-like character on the part of those in liberal democracies who are elected to office by catering to citizens and not killing them. Such paranoid imaginings also misunderstand how the dynamics of power work and weigh against grand conspiracies. For instance, conspiracy theorists misjudge the constricted reality of those in high office: They are the least likely to get away with a grand conspiracy, even if they desired to. That’s because they are always watched by friends and foes alike; it’s because the competition to embarrass and topple them is intense. That is more and not less true the higher one moves up the power pole of politics. Presidents are surrounded by friends and enemies but everyone in such circles possesses their own characters, interests and agendas. Those with laudable character would expose a colleague engaged in some heinous action, while those with opposing interests or a desire for the same office would certainly blow the whistle. Conspiracy theories that posit grand schemes involving hundreds or thousands—and span subsequent decades—have it exactly backwards: Small conspiracies where secrets and secret-keepers are few and the stakes are small can keep mum. Think of two guys who rob a bank and have an interest in each other’s silence. Those whose future political lives, to say nothing of avoiding jail, depend on not murdering fellow citizens or covering up the facts of an assassination, have very opposite incentives. That, in fact, is how Richard Nixon and his Watergate cover-up were taken down: By the very system that some think has held secrets about the Kennedy assassination for more than five decades. Those who think U.S. President John F. Kennedy was assassinated by something and someone more than just a lone gunman, have understandable difficulty accepting that his death was the tragic result of a 24-year-old Marxist, Lee Harvey Oswald, a perennially dissatisfied drifter between nations whose bullets found his intended mark. America in 1963 was a youthful nation with over 86 million people, 46 per cent of its population under the age of 25. Twenty-four year-old Lee Oswald’s three-shot marksmanship blew open the rank unfairness of life and this against a young, optimistic president who reflected back to a young America what it believed of itself. The conspiracy theorists are incorrect because they misunderstand how politics, human behaviour and power actually interact. Dallek was wide of the mark because he identified the wrong emotion—fear, rather than sorrow and also our sense of justice: An American Adonis cut down in his prime. That catastrophe was why so many then and now prefer the conspiracy explanation: because such a banal truth as Oswald acting alone feels horribly imbalanced and unjust: A Greek tragedy without meaning but with all its attendant sadness.